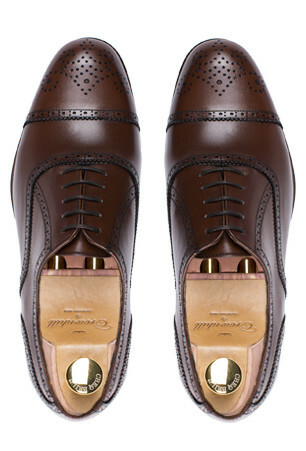 "A classic by excellence turned into a style icon"
You will find few dress shoes that will be easy to combine. Our model The Rio is a full brogue Oxford in brown hazelnut, this is a classic by excellence that has become a style essential. Handmade in Spain, we find this classic elegant enough to wear with a suit but with a careless look that will make it ideal to combine with a pair of jeans or chinos. It will be hard to find occasions where The Rio won’t be appropriate. Even if you want to use them from Monday to Friday to the office or with a gray suits and a matching belt, even if you want to take them for a walk on the weekend with a pair of jeans or chinos, The Rio will be a completely versatile choice. The Rio is a shoe with laces made with a completely artisanal process following a Blake construction. Cut in box calf of the best qualities, mounted in our Crawford last, and we obtain a more elongated and rounded tip. The leather sole has a non-slip rubber embedded Spy ideal for wet surfaces, which will get that rainy days won’t be a problem anymore. In addition, our patented Flexi Comfort system will guarantee comfort and adaptability. Estoy contento con la compra ,por la calidad de los materiales y la comodidad del calzado ademas de los excelentes acabados que le dan elegancia y prestancia.La rapidez en la entrega y toda la información del envío y la entrega. Piel de excelente calidad,remates y detalles perfectamente ejecutados y fabricación armoniosa,simple y bella de un zapato con alta calidad,gran comodidad adaptándose perfectamente al pié y muy estilizado.Excelente.Recomendable.